The thing I loved most about The Gates was the juxtaposition of an ultra-synthetic, high-tech aesthetic (the garish nylon ripstop fabric, the PVC frames) with the natural. Designer and artist Jenny Little, of the Brooklyn-based label Little by Jenny, offers similar resonance in her latest line of t-shirts for women and men, which feature iconic, elegantly overlapping high-tech/low-tech imagery hand silk-screened on supersoft American Apparel tees. The collection includes works with titles like “Lace, Floral, and Power Lines,” “Floral Arrangement with Plane,” and “Fixed Transformer” (shown here). 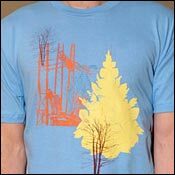 Not only are the various designs available on a colorful range of tees (teal, light pink, navy, red, asphalt, and creme), but Little offers custom combinations of images through her Website, so you can order a potentially one-of-a-kind quasi-couture tee. And unlike Christo and Jean-Claude’s recent installation, these little artworks will last a lot longer than 16 days. $25-30 at Stackhouse, 276 Lafayette St., near Prince St., 212-925-6931. Order online at littlebyjenny.com.